Pinhole leaks are not caused by inferior copper pipes (a common sales pitch of repiping companies), but are a direct result of changes in our water chemistry occurring over the past ten years. We help by addressing the water chemistry, saving you money and avoiding the repiping nightmare. 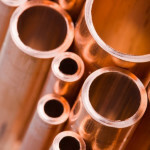 While it may be true that a lesser quality copper will experience leaks sooner, the fact remains that the water and its current load of chemicals (primarily, but not limited to, chloramines) combined with a calcium carbonate (hard water minerals) is eating the metal pipes. These two conditions are present in 100% of the pinhole leaks we have seen over the past decade. 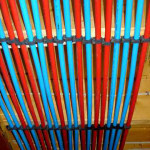 PEX repiping may not be the answer due some concerns. Copper repiping is expensive and disruptive and may not be necessary. Repiping with PEX plastic tubing or Thicker Grade “L” Copper generally costs between 20% and 400% more than installing a Pinhole Leak Prevention System from Pure Elements. The repiping process is very disruptive and many times requires a complete relocation for up to 6 months. PEX can leach MTBE in the first months, absorb contaminants that flow into drinking water, and grow bacteria. Even one hour of exposure to sunlight prior to installation eliminates chlorine resistance. If repiping using copper pipes, the clock begins ticking from the first day of installation if nothing is done to address the water chemistry. If your household plumbing has integrity today, logic says that stopping the attack brought on by today’s water chemistry will result in no further leaks, other than in extreme cases. Therefore, with the attack neutralized, repiping can be avoided altogether or left as a future option should it ever become necessary. And the attack on water heaters, toilet mechanisms, water feed lines to toilets and laundry, rubber parts and internal valves in fixtures can only be stopped by fixing the root problem: Aggressive Water Chemistry. Repiping with PEX or Copper does not offer the benefits a chloramine filter can. 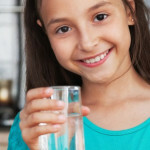 Your kids will benefit from healthy filtered water – Irvine, CA. People of Dana Point love the benefits of filtered water as well as being free from pinhole leaks. In addition, the Pure Elements’ Whole House Systems provide benefits not available with repiping, including a healthier home living environment and the reduction of hard water issues. You can enjoy quality chemical-free water for drinking, cooking, bathing and other household uses. Hard water issues are reduced to protect plumbing, fixtures, water heaters and appliances without the use of salt. Results in laundry and dishwashing are much better with less detergents, and the system is environmentally-friendly. 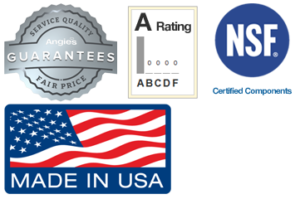 Simply repiping does not offer any changes in the water quality throughout the home. Pure Elements offers a better approach to repiping at a fraction of the cost, with the longest list of benefits for you and your family. Ask about our $1,000 Performance Guarantee. CALL (949) 259-2560 OR REQUEST A FREE QUOTE BELOW. © 2019 Pure Elements Water, LLC All rights reserved.